The WildKids team offers scheduled activities and crafts for families to do together. Create your own Stuff-A-Critter or design your own tie-dyed Wilderness t-shirt! Pick-up the WildKids Activity Schedule when you check-in or download it below. The WildKids Kiosk in the Wild WaterDome Indoor Waterpark all year long. Glacier Canyon WildKids Club: (Sept-May) located in the lower level of Glacier Canyon Lodge, directly below the lobby and next to the X-Treme Adventure mega prize arcade. During our summer months join us at Lost World and Lake Wilderness outdoor waterparks. 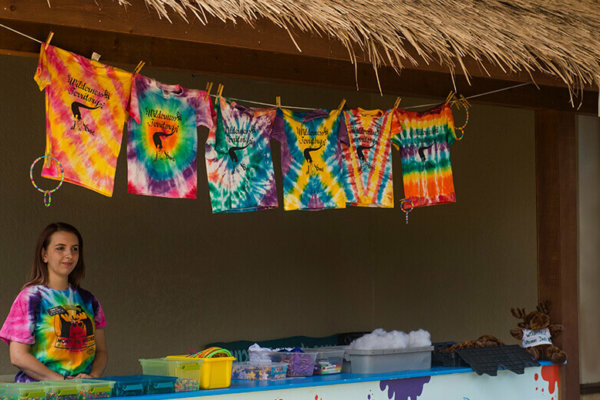 Arts & Crafts Everyday: Tie-dye your own shirt, create sand art, or do another fun craft. All make great mementos of your fun vacation at the Wilderness. Craft & activity prices range from free to $25.